What’s Thanksgiving like without any rolls? Hopefully, I will never find out. 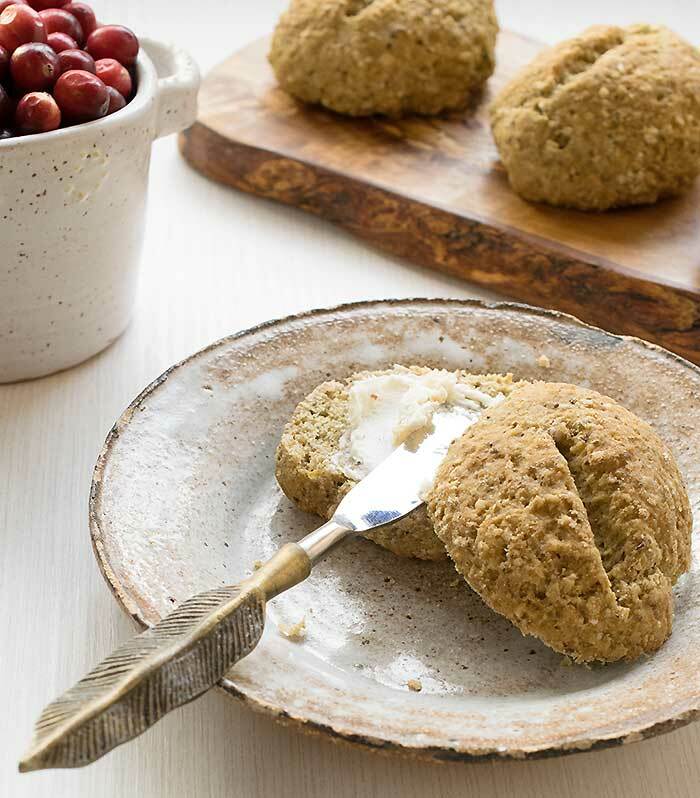 These Gluten-Free Vegan Teff Oat Rolls will look great on your table, and you’ll be beloved by any vegans or celiacs around your table. These rolls only need to rise once, so that makes your dinner come together fast. You may have avoided making gluten-free bread because you think that you’ll need a lot of expensive, hard-to-find flours. 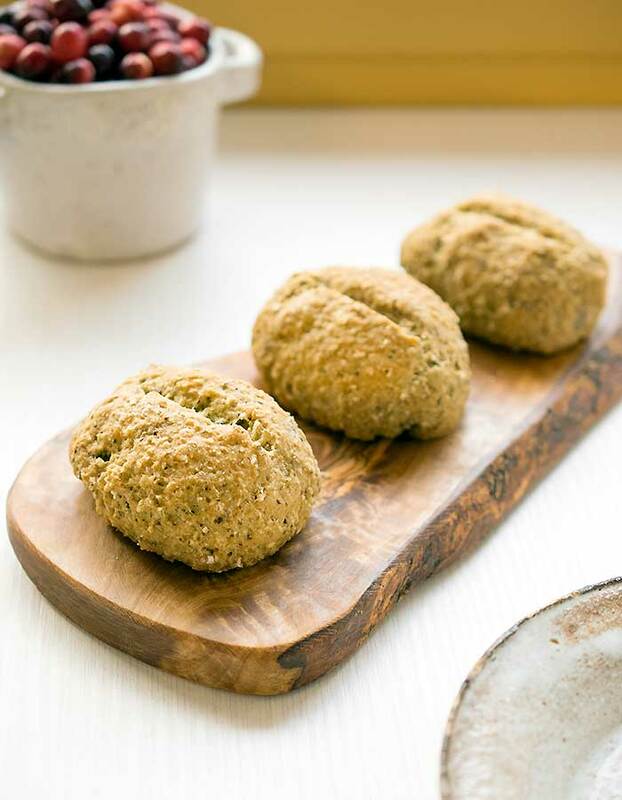 The base of these rolls is a mixture of teff flour and oat flour. You may not have oat flour, but you probably have rolled oats in your pantry. 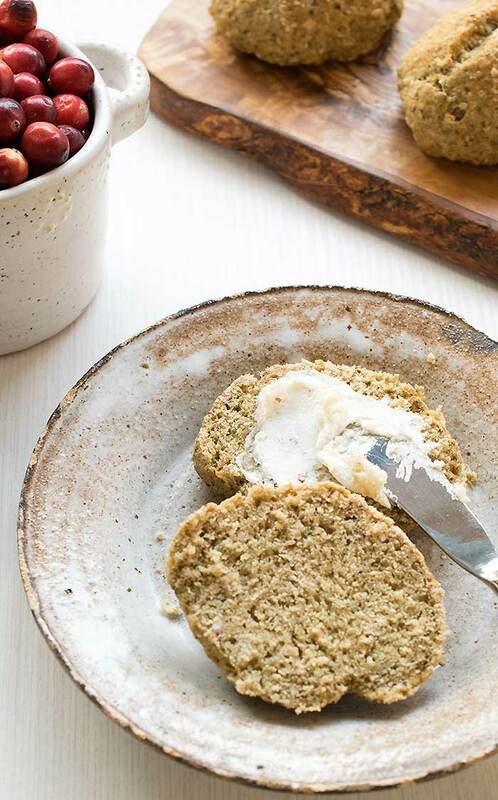 Just throw some rolled oats into your food processor and process until small, and you’ve made your own oat flour! The recipe has ground chia seeds and ground flax seed to act as a binder. I also added in some ground psyllium husk which keeps them moister and keeps them from crumbling. The best dinners have a little something for everyone. 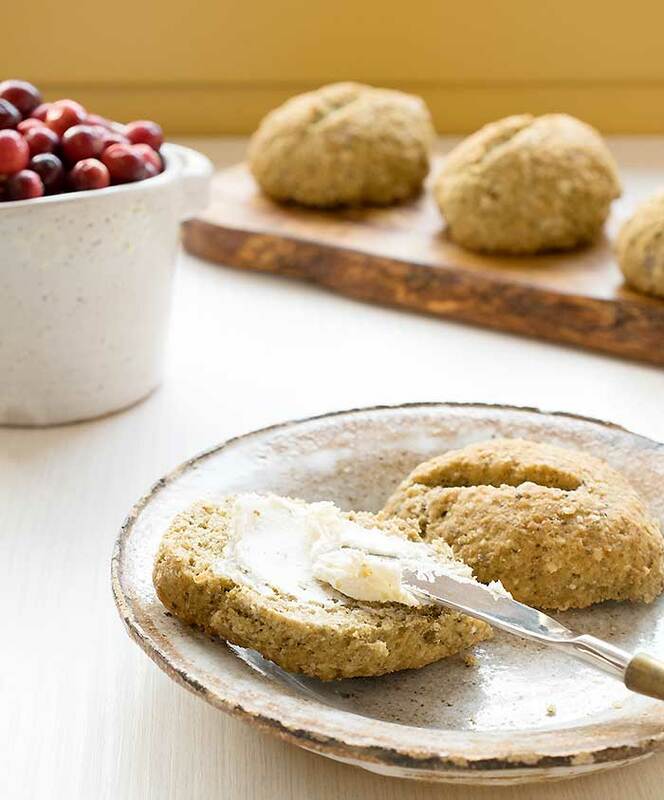 With so many people avoiding wheat and gluten, your gluten-free guests will get a warm and fuzzy feeling once they realize you made homemade rolls that they can actually eat. These are soft, moist and if you’re like me you won’t be able to stop eating them. Another plus is that these rolls taste just as fresh the next day! Preheat the oven to 350 degrees and prepare a baking sheet with oil or parchment paper. Combine the warm water and maple syrup in a 4 cup measuring cup or small mixing bowl. Stir until sweetener is dissolved. Note: The water must not be too hot or it will kill the yeast. You can test the water on the underside of your wrist. If it’s too hot to touch wait until it cools a bit. If it’s winter and your house is freezing, you can put water from the tap into the microwave for about 45 seconds to warm it up. Sprinkle the yeast over the top of the water mixture. In a few minutes, you should notice some change as the yeast gets activated. Let sit for 10 minutes. Add the Maskal Ivory Teff flour, oat flour, tapioca flour, arrowroot flour, brown rice flour, baking soda, and salt to a large mixing bowl. Mix well and set aside. 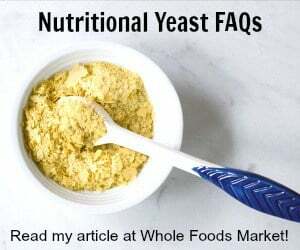 Go back to the yeast mixture and add in olive oil, ground chia seed, apple cider vinegar, ground flax seed, and ground psyllium husk. Mix well and let sit for about 5 minutes. The mixture will thicken into a slurry. After the 5 minutes are up, add the wet yeast mixture to the dry ingredients and stir with a wooden spoon. You can also do this in a mixer with the paddle attachment (not the dough hook). Mix the dough until the dry ingredients are completely incorporated with the wet ones. The dough will be more sticky than a traditional wheat bread dough. Let the dough sit for about 5 minutes before making the rolls. Form 10 rolls out of the dough, placing them on the baking sheet as you go. I also make a cut with a sharp knife down the middle for decoration. I made oval rolls, but you can make them any shape you want. If the dough is sticking to your hands, wet your hand a bit as needed. Cover the newly formed rolls with a clean dish towel and put in a warm place. In the winter I put it on top of the stove because it’s warmer since the oven is on. Let them rise for 20 minutes. They won’t quite double in size, but they should grow a little bit bigger. Uncover the pan and place it in the preheated oven. Cook for 20 to 30 minutes, or until the bottoms have turned a dark brown and the tops of the rolls are solid. *You can make your own oat flour by processing rolled oats in your food processor. It easy and cheap too! These look great. My daughter is gluten intolerant and I can’t wait to try them for her next time she visits. Do you know if they freeze well? We ate them all so I’m not sure. But maybe try baking them 3/4 of the way, then freeze and cook the rest of the way. The dough is too sticky to freeze the raw rolls easily. These look so yummy! Do you think I can sub potato starch in place of the arrowroot flour? They’re both starches, so I was thinking it might work. I think it would work, but I’ve never tried it. I’m really excited to try these roll! It’s so difficult to find good store-bought vegan gluten-free rolls. These rolls look amazing! I love baking with teff flour! Ooh these look lovely! Way more fun than white flour rolls. Any substitute for psyllium? I’m very sensitive to it. You could use ground chia seeds or extra flax. I used psyllium just for it to hold moisture a little longer. Let me know what you use and how it turns out. What beautiful rolls! I always love injera, which is made with teff. So I’m sure that I would be all over these! I am going to make these today. Have any of you tried freezing the fully baked rolls and then defrosted them for later use? How did that turn out? I have frozen the baked rolls and they came out pretty good. Perfect except…… it’s the yeast problem for me. I usually just out a tsp,of bicarb I , am hesm the bread/rolls are flatter, dense but better that than be ill,with it. But…if you have any other bits of advice I am all ears. That sounds like a good sub to me.